We are committed to giving your child an outstanding international education. Our unique approach to teaching and learning ensures that we put the needs of your child at the heart of our premium international schools to create warm, welcoming communities where each and every student thrives. Will your child be happy at a Nord Anglia school? 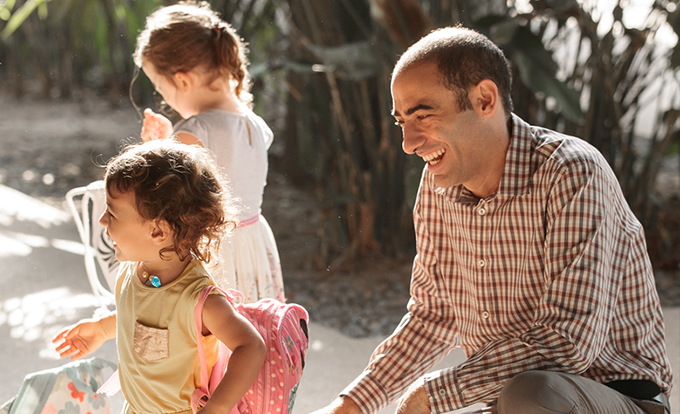 Read what people in our global community had to say in our annual Parent Survey. Responses were surveyed from more than 18,000 Nord Anglia Education parents across our family of schools. 94% of surveyed parents say their child is happy at school. 91% say their child is developing independence at school. 91% say their child receives a quality education from the school. 92% say their child has a good relationship with their teachers. "This is a lovely school. Outstanding teachers and excellent school community. My children are very happy and I am so grateful for being part of this and for being able to offer my kids this school. I do recommend the school to all my friends. It has been the best part of Singapore so far." "The school has exceptional facilities and the general level of teaching is outstanding. On a personal level my son has developed to a level beyond our expectations-- both academically and socially. Class sizes are restricted to a manageable level which definitely encourages efficient learning." "High level of education, safe place for our children, outstanding facilities, continuous communication with parents." What do our parents think of Nord Anglia Education? 98% of surveyed parents say their first contact with the school was positive and welcoming. 95% say they have been accepted into a warm and welcoming community. 93% say the school keeps them informed about general updates. 92% say the admissions process is well organised. 91% say the school provides a stimulating learning environment. 91% say the school lives up to their expectations so far. "I am very happy with the personal and social care my children receive. This is something money cannot buy as when the children feel safe, happy and respected by the adults at school many other factors become lower priorities. My children have good and great teachers which means that with these two aspects plus the support they receive at home, they will thrive." "The teachers are very friendly and dedicated, my child is very happy at school, his studies have been significantly improved, he actively participates in a variety of activities, the teachers provide great encouragement and help to him, my child has made many friends, participates in school trips, to practise independent living skills, and teamwork to work with everyone." "The school has good teachers, who are competent, professional and motivated. My child genuinely enjoys going to school and the learning process. The school follows a customized English National Curriculum, making it easy to find a comparable school when relocating to another country. The facilities, especially for sports, are outstanding."